Geylang Road is almost a melting pot of cultures on its own, being a location that boasts a vibrant F&B scene; a place known for wallet-friendly eats of various forms of cuisine. Taking up the space of the ground floor of a shophouse, Banh Mi Thit by Star Baguette is a relatively new establishment in the neighbourhood. Unlike other eating establishments that take up a space in a shophouse, Banh Mi Thit by Star Baguette is located in a double story shophouse that is a tad wider than the usual, whilst having a small yard up the entrance area. This seemingly makes Banh Mi Thit by Star Baguette seem particularly spacious, especially so considering how the space is almost bare in the middle; the only seats being counter seats that is situated against the walls of the shophouse. Furnishings and fittings are rather simple, with the walls being painted white and blue, with furnishings of both black and wooden accents complimenting the look. 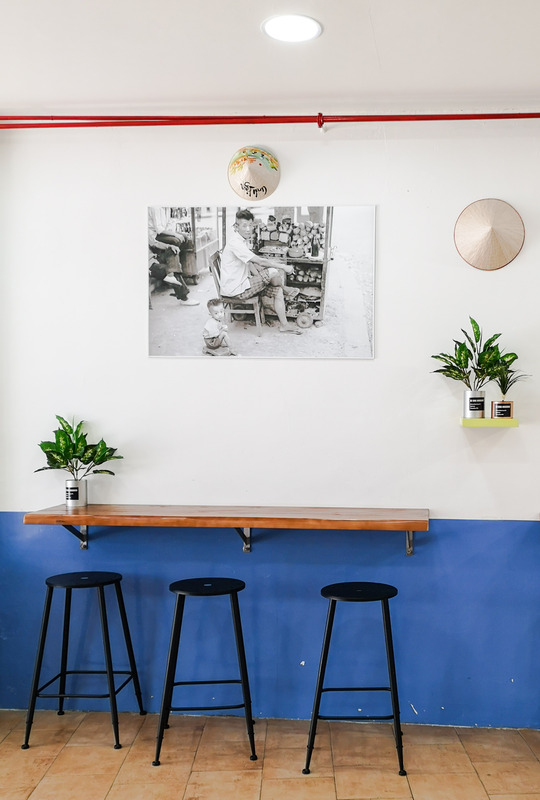 The overall vibes are unpretentious, yet truly Vietnamese especially with plants and other related decor and paintings being hung around on the walls of the space. 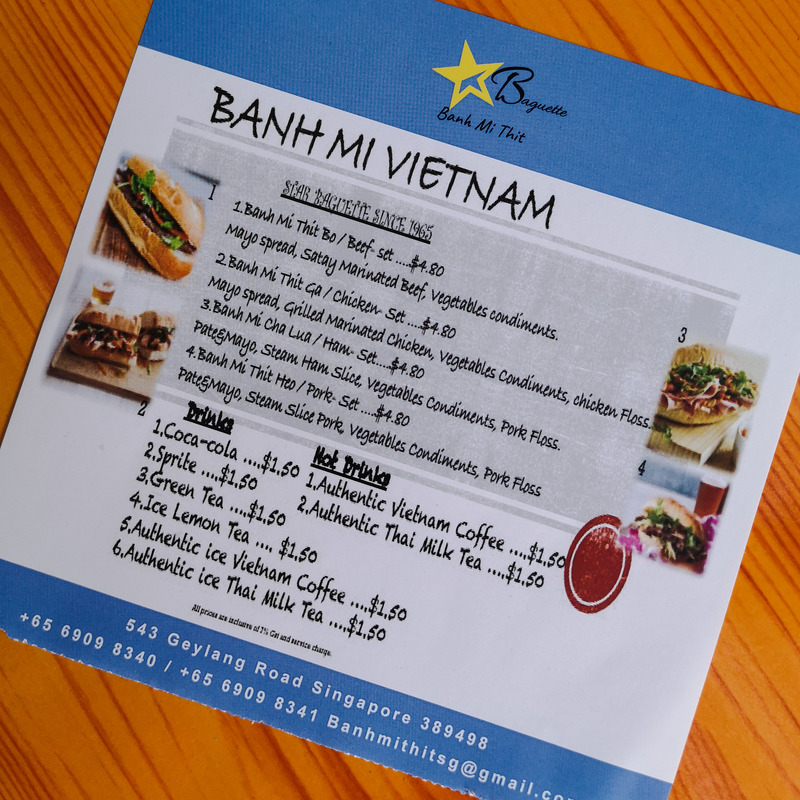 Serving up Vietnamese baguettes, the menu at Banh Mi Thit by Star Baguette is undoubtedly simple — offering only four variants of Banh Mi; Ham, Chicken, Beef or Pork, all of which available in sets or ala-carte; the former coming with a drink on the side. Choices of beverages include soft drinks and Vietnamese coffee or tea. Going for the Pork Banh Mi, the sandwich came with pickles, pork pate, ham and other condiments sandwiched in between a Vietnamese baguette that had been toasted and lightly buttered. It is worth noting that the baguettes at Banh Mi Thit by Star Baguette is being baked fresh in-house daily, ensuring the quality of the bread that is being served to the patrons. Chili is also an option here, with the counter staff asking for the patron’s preference for chili at the counter. Opting for the chili, the Pork Banh Mi is immensely spicy; the addition of chili sees the sandwich coming with raw, sliced chili padi with its seeds intact — this provides the sandwich with a fiery punch that is not in any way shy, but straight up in the face that would even set the alarm bells off for those who are usually tolerable to most levels of spiciness. The baguette itself was served lightly toasted and buttered; not only does it shatter beautifully with a nice, audible crackle when one sinks their teeth into it, but it also exudes a hint of buttery flavour that binds the various condiments together. Despite the addition of pickles in the sandwich, the pickles seemingly only helped to add a crunchy element into the sandwich; the Pork Banh Mi here feeling meatier here than being the well-balanced sandwich at other establishments. Still, something which is extremely worth the price that is also of a respectable quality whilst seemingly trying to be as authentic as possible; a steal at S$4.80 nett. 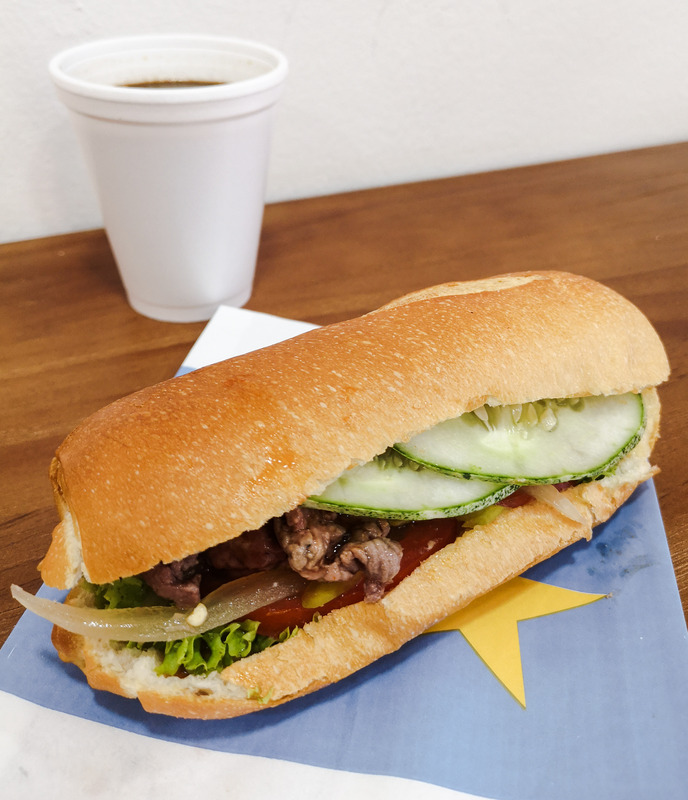 We also tried the Beef Banh Mi, which features juicy, thinly-sliced meat done medium-rare. It also comes with a creamy mayo which supposedly cuts away the meatiness, though the beef was in no way gamey as well. If anything, the creaminess helped to bind the other condiments together, bringing a slightly heavier taste profile to the Beef Banh Mi as compared to the Pork Banh Mi. Not missing out on the Authentic Vietnam Coffee here, we found it to be pretty comforting, carrying chocolatey notes whilst being rich and aromatic. A great accompaniment to the Banh Mi available here. 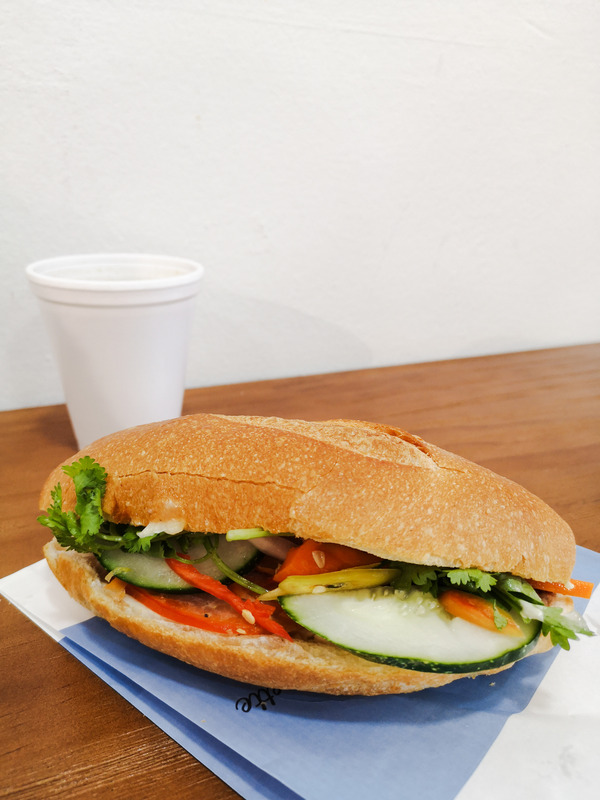 There is simply no doubt that Banh Mi Thit by Star Baguette tries to replicate the Vietnamese Banh Mi experience to be as close as the real deal altogether. Despite being located at Geylang, one could see how the space is designed to stray away from the usual layout of local eateries that maximizes seating capacity. Details are also well taken care of, including how the baguettes are being baked fresh daily. All that, coupled with the affordable price tag of S$4.80 nett for a set with drinks, Banh Mi Thit by Star Baguette certainly serves one of the lowest priced Banh Mi in town. 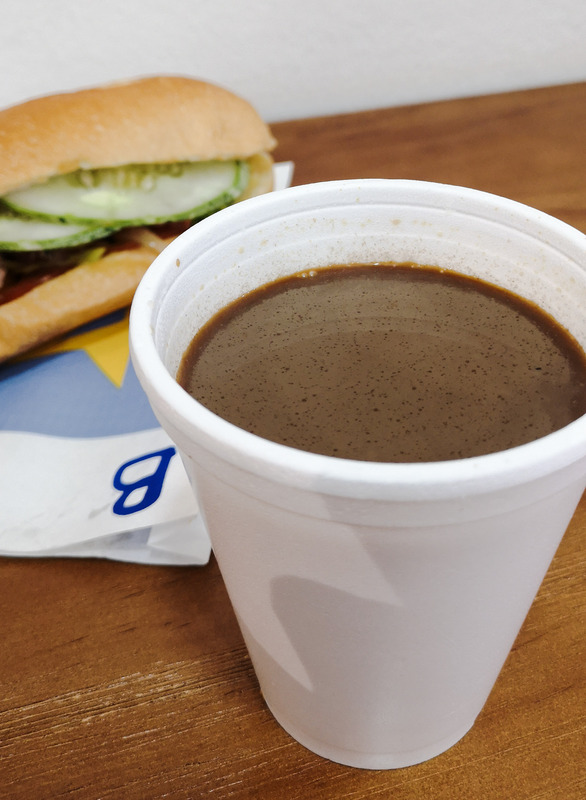 Sure, the location may be one that is not the best choice for some, but it is definitely an interesting place to hit up in the island for some great Banh Mi at a very affordable price for the experience indeed.